Located halfway between Gainesville and Lake City near I-75, High Springs Campground is an ideal overnight stop traveling to or from south/central Florida. To our west, 4 miles, is the historic town of High Springs, well known for its many antique and specialty shops. Within a short drive you will find the Santa Fe and Ichtucknee Rivers which are popular for canoeing, tubing and scuba diving. We are 20 miles north of Gainesville, home to the University of Florida, Shands Teaching Hospital, VA Medical Center, and Gator National Drag Racing, just to mention a few. 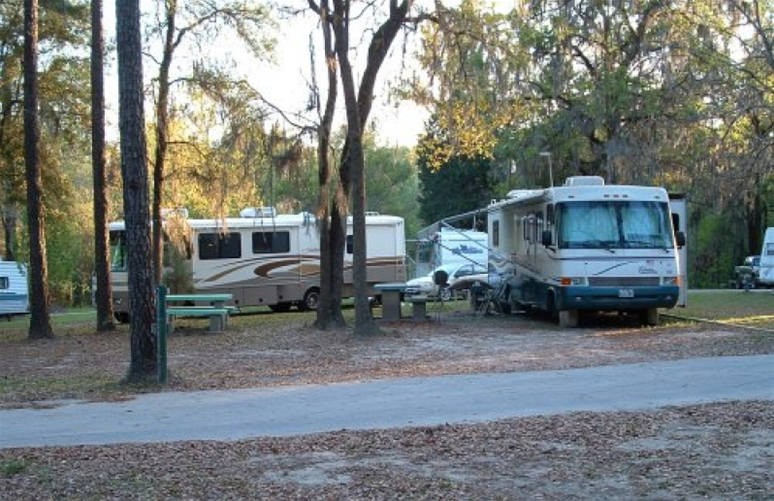 High Springs Campground has large pull through RV sites, and grassy, shady tent sites are also available. High Springs Campground is a family campground and welcomes all quiet well-behaved pets.